Ever since our formation as a corporation, Brenning Paving and Construction has been intent on delivering a service our clients can believe in and feel confident about. Since we began working in the paving industry of Ottawa more than four decades ago, our aim was simple: to build a business that would earn the respect of the community. As Ottawa residents ourselves, we felt it was important to have a service that local residents and businesses could trust to deliver a safe, professional and refined finish. Our aim is to always leave a job having improved what we found when we arrived to a large degree. If you would like to work with a team that is confident and experienced in what they do, then you are in the right place. With a hand-picked team of paving specialists, it’s now easier than ever to take things in a whole new direction – so let us know your ambitions, and we’ll match them! Based in the Ottawa-Carleton area, we’ve brought our expertise to local businesses, industrial groups, government and residents to help Ottawa look the best it can. Proud of the work that we do and capable of delivering a service that lives up to the expectations of the public, we make sure that everything we create is done so with a forward-thinking approach. We provide a wealth of services that can help to amplify your place of work area accordingly. Asphalt Paving. Making sure that you have access to a safe, smooth and comfortable pavement surface. From dealing with parking lots in commercial areas to roads and pathways, we have the experience to make sure the job turns out exactly as required. Concrete construction. We offer a wealth of different concrete construction services; all of which are going to make it much easier for you to enjoy a more simplistic path forward. Not only that, but we fully appreciate the importance of concrete being mixed, managed and fit in the most secure manner possible. This helps us know the job matches national standards, compliments your space and will last for years to come. Snow Removal. Ensuring that your space is clean and clear of snow so as to make for easy mobility for patrons and the public alike. Self-Storage. With an abundance of outdoor storage space available in South Ottawa, our storage yard is convenient and accessible for business and individuals to take advantage of on a day-to-day basis. A wealth of services are put in place to help match all of your construction, paving and other needs. Choose to work with a company that prides itself on a historical level of quality and a creative team who work as one to efficiently deliver the services needed. 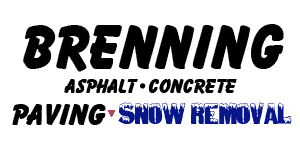 Reach out to Brenning Paving and Construction today. We’re happy to arrange a free consultation with you as soon as possible to get your project started!